At least 10 passengers from the United States and Canada were among 11 people killed in a bus wreck with a tractor-trailer in northeast Mexico, news reports said Tuesday. At least 15 passengers were injured in the Monday afternoon crash near Monterrey, on the road between Saltillo and Zacatecas, the reports said. The bus was operated by Senda Express and left McAllen, Texas, on its way to Zacatecas in central Mexico. “We are very saddened by the news this morning. We offer our condolences to the families,” said McAllen Central Bus Station Director Elizabeth Suarez. “The city of McAllen is the landlord of the bus terminal facility in McAllen. Grupo Senda is our tenant.” The passengers were mostly retired citizens from the United States, El Universal newspaper said on its Web site, adding that the injured range in age from 50 to 75. Watch rescuers work at scene of deadly crash » Citing federal police official Ruben Victoria Ramirez, El Porvenir newspaper said the accident occurred when a truck driver went off the road and then overcorrected and swerved into oncoming traffic, hitting the bus. 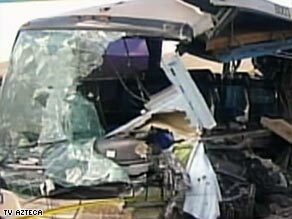 Video of the scene from CNN affiliate TV Azteca 13 showed the left side of the bus sheared off and the semi’s cab completely flattened. Rescue efforts took five hours, TV Azteca 13 reported. El Norte newspaper and El Porvenir also said the dead and injured were American and Canadian tourists. Among the news outlets reporting the crash was the official Notimex news agency. Survivors, most of them in grave condition, were taken to the Hospital Muguerza, the Clinica La Concepcion and the Clinica del Magisterio. The most seriously injured, with head injuries as well as fractured pelvises and other broken bones, were taken to the Magisterio clinic, El Universal said. None of the passengers’ identities were available Tuesday morning. The 11 fatalities consisted of five women and six men, El Universal said. Among the dead was the bus driver, identified by El Universal as 45-year-old Cesar Garcia Huerta. The truck driver, identified by El Universal and El Porvenir as Julio Cesar Rodriguez Garcia, was injured.